If you only knew the things I recycle. I could do a whole other blog just on recycling. My mother went through the Great Depression, and it changed her forever. When I was a teenager, growing up in the 50s, I remember being embarrassed in front of my friends when she would scrape the bits of butter off the wrapper and save every scrap of aluminum foil. She saved tiny amounts of leftover vegetables and the liquid out of canned vegetables until there were enough of them for soup. At the time, I resolved that when I grew up I was going to have plenty of food around and would make lavish meals from scratch and no leftovers. And I fulfilled that promise to myself for years. Mother was an artist. Not only did she save every little scrap in the kitchen, that sensibility extended to her art studio. She saved the cardboard stiffeners out of my Dad’s laundered shirts for us kids to draw on. She used tin cans and peanut butter jars for her turpentine and linseed oil. She mixed paints in discarded aluminum pie pans, which also came in handy for saucers under flower pots. She made her own canvases, mounted on hardboard using rabbit skin glue. But though she insisted on her own professionally-made canvases, she was not above painting on old pieces of salvaged barn board or heavy cardboard that she would rescue from a bin. I didn’t know it at the time, but those little things I saw my Mother doing stuck with me, and have started to show up now that I’m older and wiser, and less easily embarrassed. And besides, recycling is cool now. In recent years, my culinary habits have been more like those of James Beard, who could make a fine meal from whatever three ingredients he found in the refrigerator. And yes, I do save leftover vegetables and stock for future soups. It’s a time-honored family tradition that fits me like a comfortable pair of shoes. In the studio it’s the same. 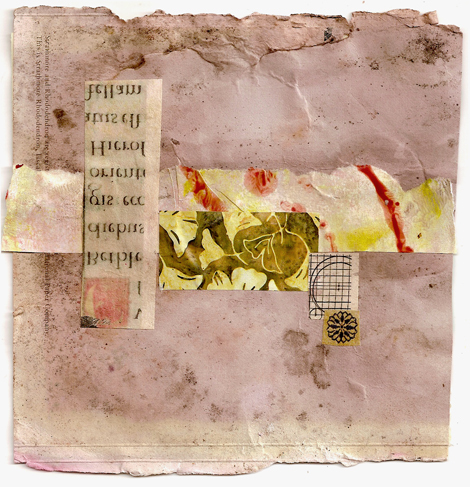 I so enjoyed making collage papers out of used deli paper last week. Now I have my eyes on coffee filters and perhaps tea bags! Used brown paper is a favorite of mine for painting and making into collage papers. Everything within my reach is now considered possible art materials. It’s a relief to know that now everyone is recycling, and that it doesn’t seem so odd. After all, it’s what we should have been doing all along. And so I guess my question for you is: What is the most unusual or innovative thing you’ve recycled in making art? There’s an old saying: Make do or do without. Use it up and wear it out. I think anyone who was raised by depression era family or prairie people (or both, as in my case) have these things ingrained in them from the time they are small. I live in the land of the tree huggin’ Granolas (British Columbia, Canada) now and my prairie upbringing has stood me good stead. I taught mixed media for years and I told all my students “there is no garbage”. I like the idea of making art from what you have on hand and if you need something, trading an art friend for it. When I need to fresh up my collage fodder, I just swap with a friend! Lelainia, I love that old saying. My parents told me it used to be repeated during WWII when things were scarce. I was born during the war and still have my own ration book!! It’s such a treasure I wouldn’t dare use it in collage, but I sure could scan it. I also like what you told your students. I hope it has stuck with them. It sounds like your mother’s quite a gal, and you picked up a terrific “habit” from her. Good for you! Yes she was that, Motherkitty. I could tell you so many stories about her! The last couple of years I’ve challenged myself to recycle items for Christmas gifts to co-workers. The first year was renewed small frames found at the thrift stores, pulling out what ever was in it and replace with my own watercolors. The next year I shredded Starbucks cups (one cut) and wove into square or rectangle coasters. Those have lasted 2 years. Last year, I found used cear acrylic tree ornaments and filled with colorful shredded materials. This year I want to tackle reusing/repurposing wine and beer bottles for glasses and vases. Gotta find a decent bottle cutter. I love recycling, repurpose, renewing! What a wonderful idea to make gifts from recycled things, Barbara! I can say without a doubt that friends (and even family) always appreciate something made by hand. I would love to have a bottle cutter too. That would be fun to do. Mary Helen, those deli papers are great, aren’t they? I’m going to make more! Yes! Yes! Use them. Can’t wait to see the results. Isn’t it interesting to have connections across the oceans, I’m finding it more and more as I visit blogs. Those miles sure do shorten. Sassa, the best thing about blogging is connecting with like minded souls all over the world. It’s such a thrill to discover our commonalities. You and I, then, must be close to the same age. I still have my own ration book from the war, even though it was issued when I was a baby! And I’m sure my mother must have used those butter papers in the same way. Margaret, I’ve seen your garage and would call you the Queen of recycling! And your art is a wonderful testament to that. Speaking of which, my next-door-neighbors have an average-looking pine coffee table out behind their shed, next to my fence. At least one of the legs is off and lying next to it. And I think another piece is a drawer from the same table. They are obviously letting it sit out there until they burn their trash again. Knowing them, they’ll probably burn it. Aw, now I probably shouldn’t have told you about it. It’s such a waste!! I know!!! I’d mail the stuff to you but that would kind of defeat the purpose.